Summary: All Megan Rix ever wanted was a baby. Yet, month after month, Megan's dreams were dashed. Would her life ever feel complete? I know that you're not supposed to judge a book by its cover, but seriously, how could I resist this face? He's just so darn cute. I am admittedly not an "animal" person, but I have been known to enjoy a heartwarming story or two about a dog (i.e. THE ART OF RACING IN THE RAIN and MARLEY AND ME.) So I figured THE PUPPY THAT CAME FOR CHRISTMAS: HOW A DOG BROUGHT ONE FAMILY THE GIFT OF JOY by Megan Rix might cause a similar reaction in me. Plus, it's the holiday season and I do enjoy sentimental stories this time of year. THE PUPPY THAT CAME FOR CHRISTMAS was a touching story about Megan Rix and her husband... and their lovable dog Traffy. Megan decides that she wants a baby more than anything in the world, but she has a difficult time conceiving a child. While going through fertility treatments, she decides to explore some other options in an attempt to find some sense of fulfillment. She and her husband begin fostering golden retriever puppies and training them for future work as service dogs. First, Megan and her husband take in Emma and then Freddy. Both animals showed great promise to be service dogs, so they "lost" them after only six months. Because Megan became so attached to these dogs, she decides that fostering puppies is just too painful for her. Instead, she decides to adopt her own puppy which they name Traffy. It is an instant love affair for everyone involved. 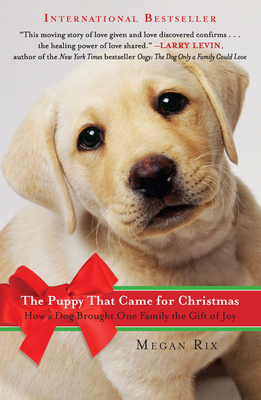 THE PUPPY THAT CAME FOR CHRISTMAS wasn't really a Christmas book at all despite the title, but that didn't affect my enjoyment of the story. (Megan actually got Traffy around Christmas and I do think she'd say it was one of her best gifts ever!) I can't say that I was disappointed that it wasn't more of a holiday story, but I can admit that I was a little surprised based on the title and the bow on the cover. Having said that, the book did epitomize all those gushy holiday feelings, so I guess that kind of makes it a holiday story! While there is absolutely no way that I could ever be a foster dog owner (I can blame Booking Son's allergies, but my hesitation goes way beyond that), I appreciate that Megan and her husband were able to take in and train two dogs for such a noble cause. I understood how Megan became so attached to these dogs because really, they were her babies. In addition, I enjoyed the author's honesty as well as her storytelling abilities. I feel pretty confident in saying that dog lovers will just embrace her story! THE PUPPY THAT CAME FOR CHRISTMAS is the perfect example of how a pet can change some one's life... and even fill a major void as in the case of Megan. This book was an instant best-seller in England and I believe that many people will not only relate to Megan's love affair with a puppy (or two or three), but also her attempts to have a baby. If I'm being entirely honest, I appreciated the parts of the novel about Megan's quest to have a baby as much (if not more) than the doggy parts. THE PUPPY THAT CAME FOR CHRISTMAS might not be a traditional holiday story, but it is a heartwarming one about love and finding joy. I recommend it to pet lovers and fans of memoirs. I can't imagine being a foster dog owner either! I don't think I would be able to give up a dog after having it in my home for a while. I just adore dogs...and miss mine terribly this season. I so admire the people who foster those dogs. I guess knowing how much that dog will help someone else makes up for the pain of losing them. I agree with you that the title of the book is misleading. I think it takes a special person to raise service dogs. I would have a hard time with it too. I become very attached to animals. Even though it would be for a great cause, it would be heartbreaking to me.